Designer Spotlight || Frampton Co. 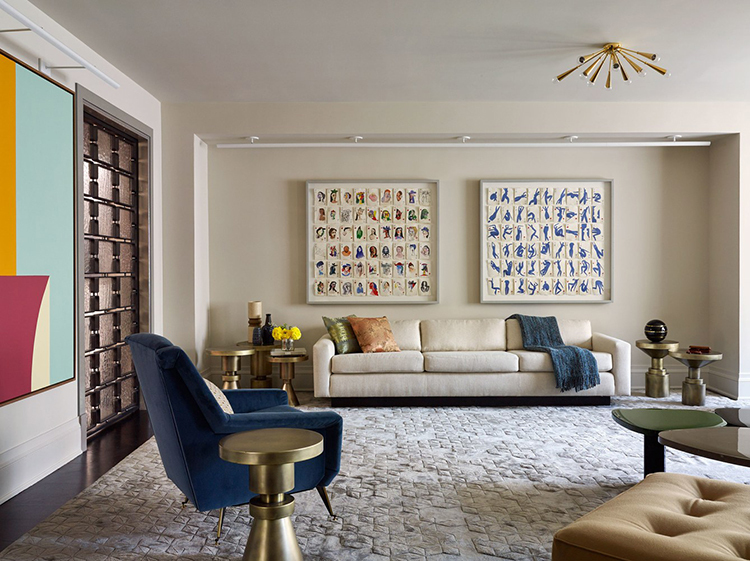 I was immediately intrigued by this space I saw recently designed by Elena Frampton from Frampton Co. It is comfortable and elegant but doesn't take itself too seriously. 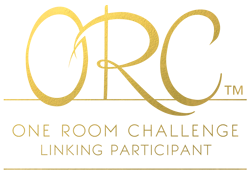 It has a playful edge that makes it interesting. 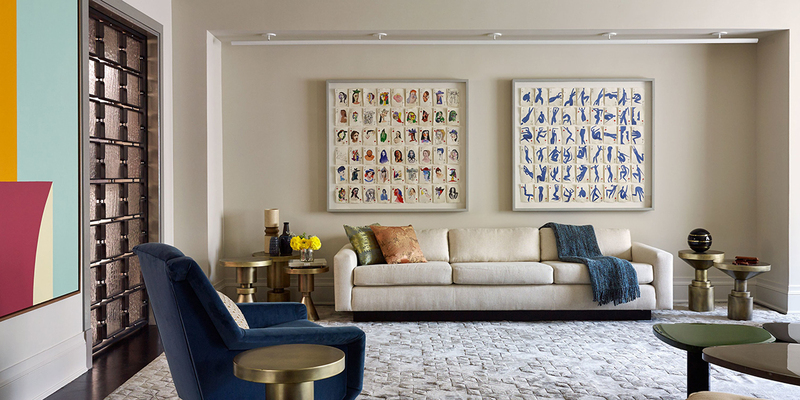 The owners of this NYC apartment don't live here full-time so they passed up some practicality for “witty luxuries” as Elena Frampton explains in her interview on Architectural's Digest. There are some great ideas in this home that caught my attention. I love how in the photo below, the family room is directly tied to the kitchen. 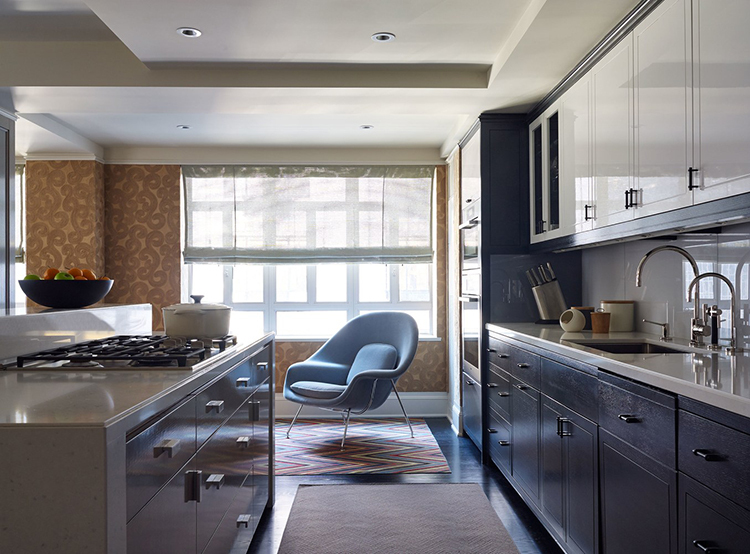 How amazing to have a womb chair near the ovens! I would happily sit there by the warm and toasty ovens reading while my flourless chocolate cake bakes and permeates our home with that delicious aroma! 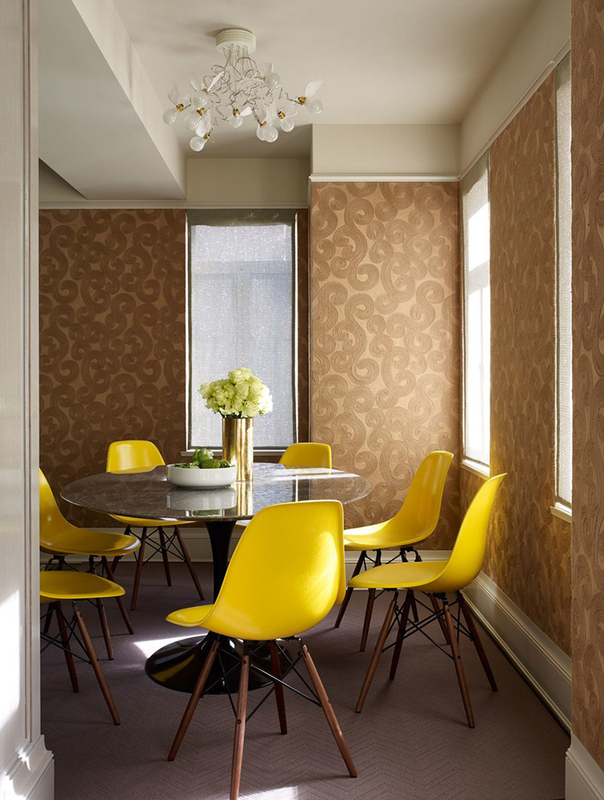 Bright yellow chairs are sure to crush any early sings of depression. 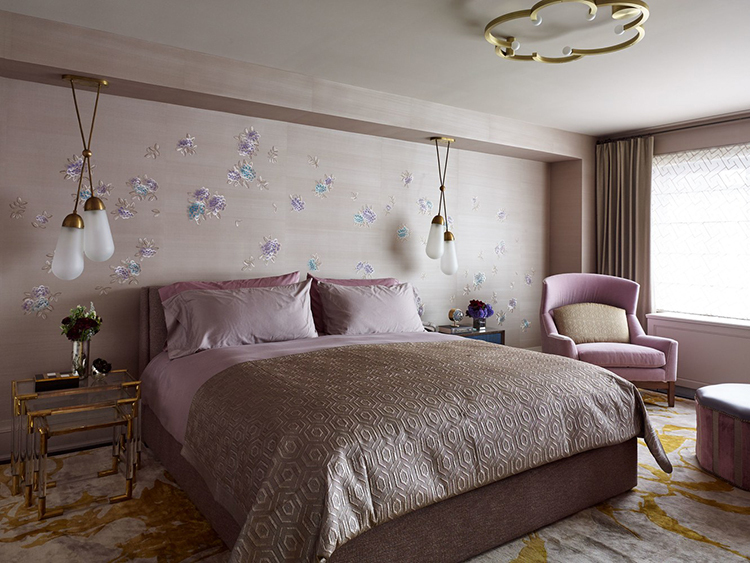 I love the large scale photograph on top of the bed. We have a similar look in our master. 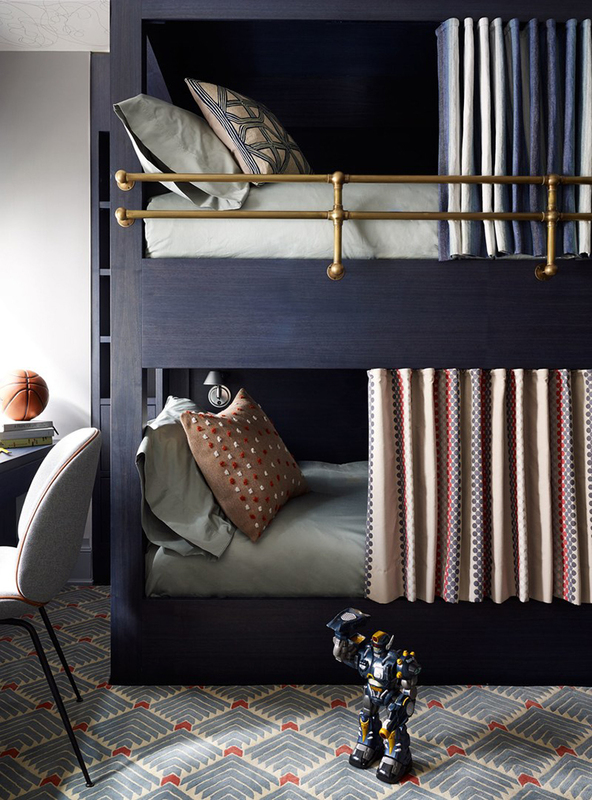 This is bunkbed heaven! Grey and brass are one of my favorite combinations. And really that beautiful rug is perfection. Another photo of the living room because the art by Holly Frean is pretty great. 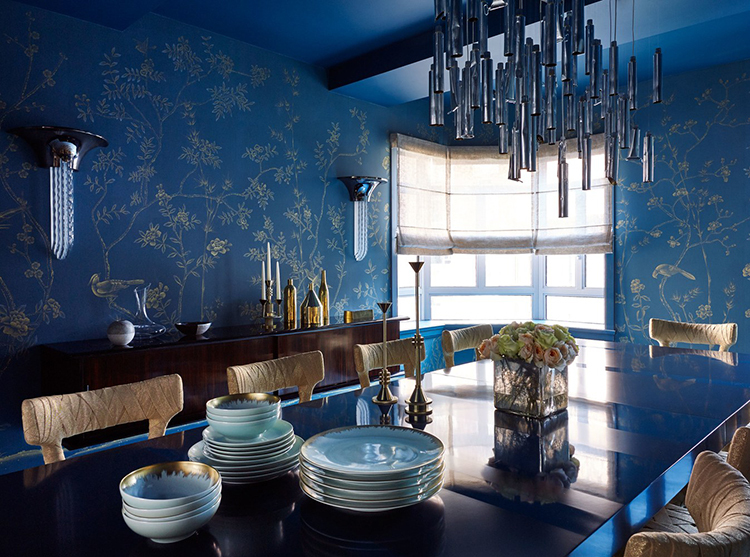 The intense blue de Gournay wallpaper is everything, especially when combined with a blue ceiling. It totally transports you. I really enjoy the bedside pendant look. These are sensational. 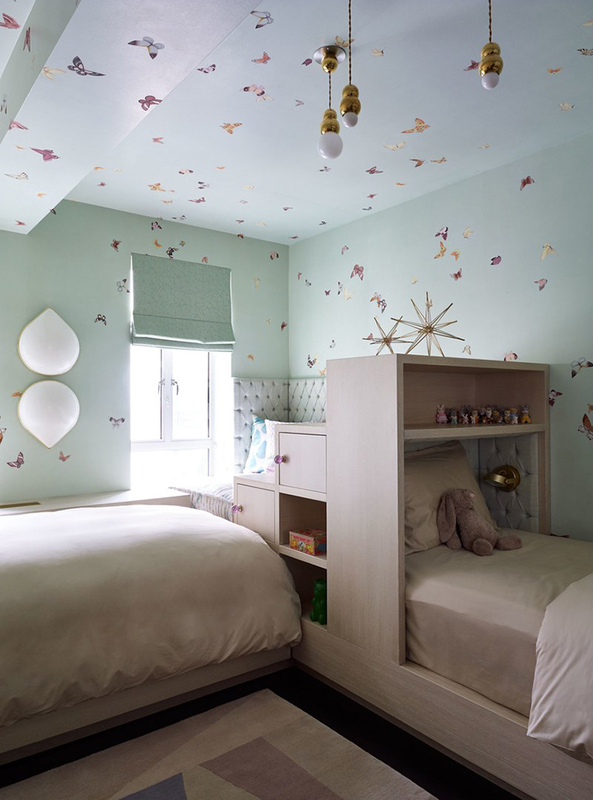 A whimsical little girl's room with de Gournay butterflies all over. What a lucky girl to enjoy this handpainted wallpaper from such a young age! I'm completely #obsessed with those cute little pendants by Michael Anastassiades. I think I will share some of his work tomorrow. I get easily excited by lighting designers. To see more of Frampton's portfolio visit here. Yes, all the key pieces in all the space are timeless chic! In love with the Holly Frean art!!!!! The whole space is to die for! My fav was the dinning area and the little girls room!! Plus the lighting is exquisite! !